My new year’s resolution this time last year was to do more exercise. In planning how to do it, I realised that my biggest barrier was the hassle of travelling to and from the gym. That’s when I made the decision to set up a home gym. Sourcing the gear to fill out my basement was going great until I began thinking about my back training. I knew I had to have a decent piece of gear to get my pull ups done. I also knew that the marketplace is filled with dubious contraptions that could be potentially fatal. Thank goodness I stumbled upon a company called Iron Gym. The very name gave me confidence. Iron Gym sounds like heavy duty, right? Well, that’s all I needed to purchase their Iron Gym Pull Up Bar. Turns out it was one smart investment. Check out Iron Gym Pull Up Bar review to the get low down on whether the Iron Gym deserves to be hanging in your home gym. Stability – You’ll be relying on a small piece of metal to support your bodyweight for multiple reps, so you need to have confidence that it’s not going to let you down. The bar should feel rock solid to the pull, with no sway or wobble. Maximum Weight – You need the bar to support your body weight now and you and some extra plates when you get stronger. The door way pull up bar standard max weight is 300 pounds. Attachment Method – Most doorway pull up bars feature an over the door frame hanging support system. You need to know the minimum width door trim required. If it’s more than an inch, you’ll be limiting your doorway options. Door Trim Disturbance – The last thing you want is a damaged doorway, especially if you are renting your property (that’s a recipe for losing your deposit!). Check reviews to see how much, if any, scratching or indentations users have had to put up with. Multi grip options – Look for a bar that offers options beyond a straight bar handle. Curved ends along with extra parallel bars for a neutral grip will take your back training to a whole new level. Extra Features – Some bars allow you to do extra exercises when the unit is dismantled from the bar. Push ups, dips and crunches along with a bunch of core exercises will extend the uses of your investment. 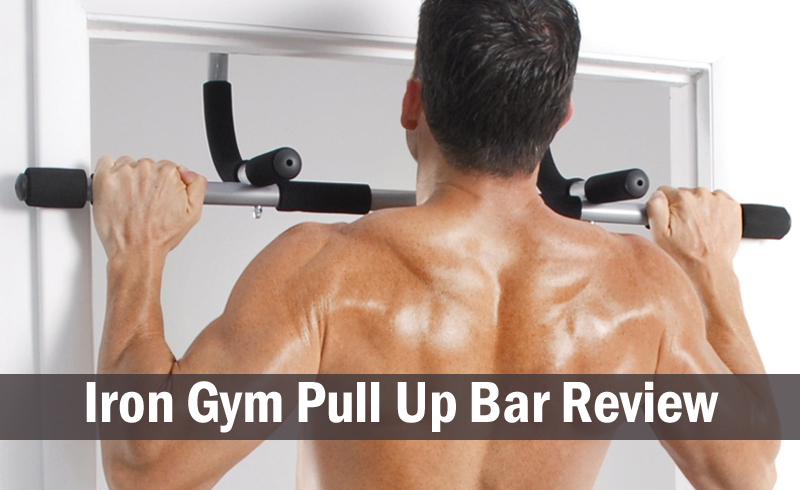 The Iron Gym bar comes in a regular and as an extreme pull up bar. Both units come completely disassembled. The assembly instructions are clear and both units can be put together in less than 15 minutes. The standard version of the Iron Gym features three grip positions; standard, neutral and wide. Parallel grips allow for hammer pull ups, which are one of the most effective ways of doing the movement. The extreme pull up bar features an extra wide grip that allows you to take your arms beyond the width of the door frame. Both versions make use of the counterweight of your body to securely lock the bar in place. They also both feature a clip that locks that cross plate in place above the door frame. The metal framework of both units is heavy duty and robust. Both bars will work on doors with widths between 24 and 32 inches. The bar is not adjustable on either version of the Iron Gym Pull Up Bar. The lip of the door frame needs to be completely flat and about three inches thick. Both versions of the Iron Gym include ab straps to allow you to work your core. You can use the detached curved bar for deeper push ups and for dips. However, you won’t really get enough movement out of the dip range of motion to have an effect. The major difference between the Iron Gym and the Iron Gym Extreme is that the latter version of the bar comes with an extended wip grip handle set-up that allows you to do pull ups beyond the outer width of the doorway. The cost difference is normally about $10. That extra ten bucks will give you the opportunity to work your back a lot more intensely. Multi grip options, including neutral grip for hammer pull ups all you to work your back from a range of angles. Extra wide grip on extreme version allows you to work your lats wider than normal. Solid construction and rigid lock in design gives you peace of mind that you will be totally secure when you perform the movement. Hand grips at all gripping positions allows you to maintain a firm grip even when you are sweating. Ab straps included to allow you to perform a raft of core exercises safely and securely. The IKONFitness Pull Up Bar is a quality multi functional upper body workout unit that offers all of the features of the Iron Gym. It works on doorways that are up to 32 inches wide. It provides you with a very safe, secure and robust way to fo your chin ups at home. The IKONFitness pull up bar comes in a sleek black finish.The maximum weight capacity of the IKONFitness pull up bar is 440 pounds. This affords you the peace of mind of knowing that your equipment will not fail when you’re repping out on your back workout. You’ll also be able to add extra weight when you feel like a greater challenge. The Perfect Fitness Doorway Pull Up bar provides you with 3 gripping options to allow you to hit your back from a unique angle. The durable construction and push / pull lock in design allows you to confidently work with weights up to 300 pounds. The parallel bar handles allow you to do a whole litany of pull up variations, including hammer pull ups. The bar features foam rubber pads at all hand contact points to enhance your lifting comfort. This unit comes a one year year manufacturer’s warranty. The Ultimate Body Press Wall Mounted Pull Up Bar offers a solid, reliable and extremely sturdy wall mounted pull up option. The angled ergonomic grips and range of grip options provide flexibility and comfort. It gives a decent wall clearance and allows for extra movements such as dips and accessory moves with gymnastic rings. The Iron Gym Pull Up Bar is an extremely impressive unit for the serious home athlete. It offers an attractive range of pull up options to put it on par with more pricey alternatives. The extra wide grip of the extreme version is certainly worth the extra ten dollar investment. Just make sure that your doorway framing is able to support this unit before your throw down your hard earned cash. If it is, you will get many years of service out of the Iron Pull Up Bar. Don’t forget to check this out for the review of best doorway pull up bar as well as this article about The ProSource Doorway Pull Up Bar.